Did you know that ferns remove toxic chemicals from indoor spaces? They do, and we feel this is an under-appreciated point among consumers but a great opportunity to market and sell this great plant. Boston-type ferns and other plants improve the air quality of indoor environments by absorbing formaldehyde, benzene, trichloroethylene, xylene, and toluene and reducing peoples’ exposure to those nasty airborne chemicals. In the 1970s and 1980s, NASA conducted in-depth studies on indoor air contamination that had become a problem on the Skylab space station. Long story short, ferns came out on top for eliminating formaldehyde (an irritant and cancer-causing pollutant) found at low but significant levels in a wide variety of indoor products such as carpet, flooring, paper products, particleboard, plywood – lots of places! 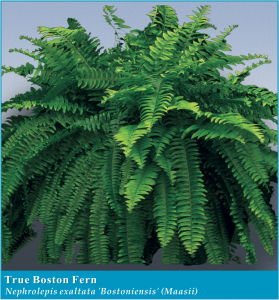 Ferns are also very efficient at removing xylene and toluene that are also common in indoor air spaces. Around the same time that Wolverton was conducting his research into VOCs, the United States found itself in an energy crisis. In response, builders began making houses and offices more energy efficient. One of the best ways to do this was to make the buildings as airtight as possible. While keeping temperature-controlled air in place, this approach reduced circulation. Combined with the modern use of synthetic materials, this contributed to what became known as Sick Building Syndrome, where toxins found in synthetic materials become concentrated inside sealed buildings, making people feel sick.The solution Wolverton sought was not to make indoor environments less energy efficient or to move away from the convenience of synthetic materials; rather, the plan was to find a solution that restores personal environments. The answer, according to a NASA report later published by Wolverton in 1989, is that “If man is to move into closed environments, on Earth or in space, he must take along nature’s life support system.” Plants. One of the NASA experiments testing this solution was the BioHome, an early experiment in what the Agency called “closed ecological life support systems.” The BioHome, a tightly sealed building constructed entirely of synthetic materials, was designed as suitable for one person to live in, with a great deal of the interior occupied by houseplants. Before the houseplants were added, though, anyone entering the newly constructed facility would experience burning eyes and respiratory difficulties, two of the most common symptoms of Sick Building Syndrome. Once the plants were introduced to the environment, analysis of the air quality indicated that most of the VOCs had been removed, and the symptoms disappeared. The full NASA report, conducted by B.C. Wolverton, is here. 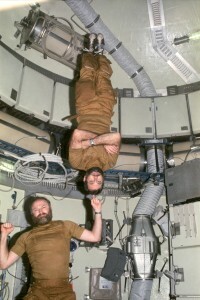 Second image: Skylab 4 astronauts Gerald Carr and William Pogue, 1974. No copyright attached.